In loving memory of Kwok Wai Chan. Kwok Wai Chan (Wiley) cultivated a ritual out of making Sunday dinner, from early morning tea to shopping in Chinatown to the intricacies and timing of elaborately cooking the food from his childhood, sustaining a weekly tradition that now spans the generations. 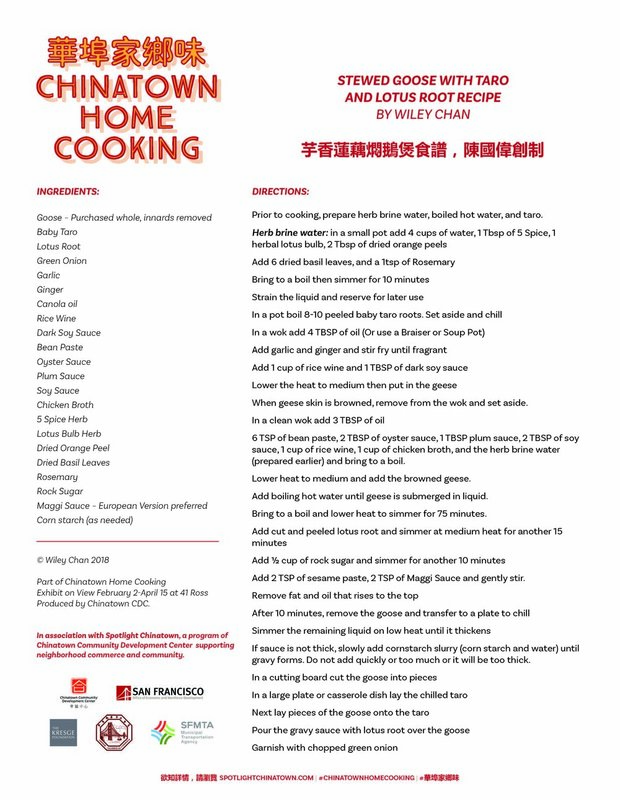 This exhibition curated by Chinatown Community Development Center explores how four local immigrant home chefs provide everyday nourishment and create a sense of belonging through their Chinese culinary traditions. The centerpiece is Kerry Chan-Laddaran’s 週日晚餐 short film Sunday Dinner, produced by Bummer Lamb Pictures, that premiered in 2017 CAAMfest. The film, along with photographs by Emma Marie Chiang 蔣智明and stories share chefs’ journeys shopping at Chinatown’s many grocery, meat, fish, and dried food stores and then preparing dishes that offers a taste of home for their families. Home chefs are purveyors of everyday sustenance and keepers of culinary techniques and traditions which span generations. San Francisco’s Chinatown plays a key role as a destination for Chinese American home chefs hoping to maintain and rediscover their culinary and cultural roots – patronizing their favorite grocery and dried foods stores that form the heart of neighborhood’s economy. Chinatown’s many businesses provide these chefs with a wide variety of fresh, affordable, and hard-to-find ingredients for traditional home-cooked meals. While the spread of large Asian supermarkets around the Bay Area speaks to the impact of Chinese cuisine on broader American society, the oldest Chinatown in the United States still remains a destination for home chefs who visit daily, weekly, or monthly, many having done so for decades. Wiley Kwok Wai Chan 陳國偉 is just one home chef who has cooked elaborate meals for his relatives, many who he sponsored to come to the United States, for decades. As the head of a sprawling family, Chan drives from Burlingame to San Francisco Chinatown haggling with market vendors over the price of rock cod, lotus root and young chicken; hauling his delicacies home for washing, cutting and slicing; and then filling his home with the fragrance of garlic, onions, ginger, simmering fish, braised duck and steamed chicken — and the sounds of his children, grandchildren, friends and elders who come knocking for dinner. Kerry Chan-Laddaran's short film, Sunday Dinner, produced by Bummer Lamb Pictures, captures how these occasions are an important ritual and gathering for his family members to share their cultural traditions and come together. Celebrated at the beginning of the traditional Chinese lunar calendar, the Lunar New Year holiday pinpoints a time of renewal and the onset of spring. The family reunion dinner is often the highlight where relatives gather from near and far. 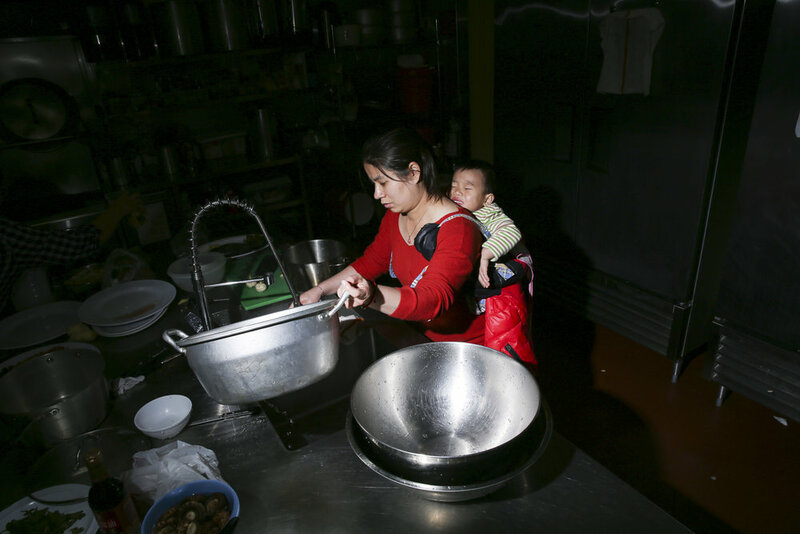 Every year, families living in San Francisco Chinatown’s many Single Room Occupancy (SRO) buildings grapple with preparing Lunar New Year’s dinners in small, communal kitchens. This year, three women, Gui Fang Zeng 曾桂芳, Wei Ling Yu 余慰玲, and Qiu Ping Guan 關秋萍 from the SRO Families Collaborative cooked in Chinatown’s YMCA kitchen, sharing how they shopped and created dishes together for this special holiday. The women visited multiple stores for produce like oranges, mushrooms, and choy; dried foods like shrimp and fish stomach; and fresh meats like chicken, fish, pig knuckles and lamb. The chefs selected familiar dishes from their hometowns with ingredients that have similar sounding names to Chinese words like prosperity, good luck, or counting money. These dishes also offered to honor household and heavenly deities as well as ancestors. With 10 dishes, plenty for a feast, one cook shared that this abundance of fish and meat served on New Year’s Eve represents a wish for the coming year, that in ones’ family that there will always be enough to eat. The Chinatown Home Cooking exhibition aims to capture the experiences of home chefs -- sharing the sights and sounds of the stores, the atmosphere of busy neighborhood, as well as the aromas and flavors of the dishes. By cooking and eating together on special holidays and every day gatherings, these chefs create a sense of belonging within families and communities, serving happiness and filling bellies with a unique culinary heritage. Cooking is a way of life – the dinner table, a platform where multiple generations share and make memories.